I adore days like this: perfect weather... just enough fall foliage left to compose gorgeous autumn photos. And the chance to work with a family comprised of amazing people and treasured friends. We’ve known this family for years (funny how being a parent has made me start to believe that all the cliches are true... time really does fly). Our kids have shared the thespian experience and art school, as well as having shared the rather unique experience of being in professional theatre together (that’s a unique kind of bond, to be sure). This wonderful mom has become a treasured friend of mine and is part of my “tribe” of art-inspired book lovers and mothers. In addition, she is an incredibly talented artist… check out her website to see her beautiful, evocative and life-filled paintings! 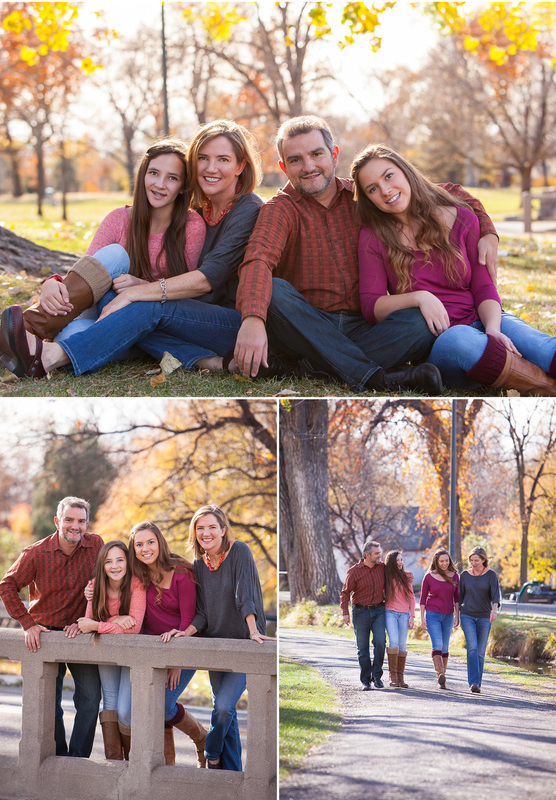 For this collection of family portraits, we wandered around the always-makes-me-happy Wash Park, just southeast of downtown Denver. It's a great spot to capture relaxed, loving and warm portraits on a quintessential autumn day. What a treat is is to get to play and witness another side of my friends when I photograph them. One of my favorite things about family sessions is watching them enjoy the excuse to focus only on the act of connection, laughter and experiencing together-time… all outside on a lovely day. This family is as good as it gets -- kind, intelligent, talented, respectful and ready to laugh together. Truth be told I often wonder whether it’s the memories that we create during a photo session, or the portraits themselves that are most valuable in the end. Either way is ok with me! Thank you guys for letting me photograph you!! I adore you! I’m a Denver based family portrait photographer specializing in creating relaxed, natural and timeless heirloom photographs to last for generations. Your family pictures will be styled around YOU, and the actual experience promises to be a fun and memorable one for kids as well as parents. Drop me a line to find out more!